The other day I received a cute little product for Eva from the SweetPea Toy Company Ltd.. It was the SweetPea3 MP3 player and it was a cute purple color. Eva has so much pink that I thought that purple would be a nice change of pace. This is a very simple MP3 player that was easy for Eva to use. She took to it right away, dancing to the preloaded playlist of songs. 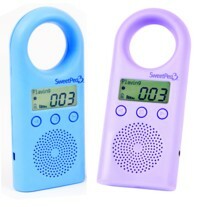 The SweetPea3 MP3 Player for Kids has a smooth rubberized finish and is easy for kids to hold because of the giant hole/carrying loop at the top of the player. Eva enjoys carrying the player and listening to her Mr. Ellis Music (Ellis Paul, her favorite singer). I was easily able to transfer our existing music right onto the player into one of the three playlists. There is a list with some preloaded music and then a second with more music and then one that is empty of music all together. I simply connected the SweetPea3 MP3 Player to my computer and dragged and dropped the songs I wanted right into the playlist. This works on both MAC and PC. If you are like me than you have a concern for your children’s hearing. Eva can use an iPod and iPad and while I like that I don’t like that she can boost the sound easily. With the SweetPea3 the controls for volume of the player AND volume of the player when using headphones is hidden so that she cannot change those settings. Also, she cannot accidentally erase anything from the player. As a parent having that control and peace of mind if wonderful. The player is battery powered and has the option of using an AC adapter as well. (AC Adapter sold separately on the website.) On battery power the player is said to get 32 hours of play time. Also, the player has 2GB of storage space, perfect for lots of songs on those long car trips. Did you get the AC adapter, the batteries in mine are already toast. The ones that came with it were dead too. So I put new ones in and Eva used it so much that they died too. I guess we go with rechargable ones. Wish this was rechargable, it is big enough. Awww how cute. I bet my boys would luv these. My daughter owns one that is geared toward her age and they always try to take it. It is nice for the kiddos. Eva enjoys hers. I have never seen one of these before. My teen daughter would get a kick out of this.. Maybe it will last Her longer than 6 months too. It looks and feels pretty durable. 🙂 It is one solid chunky MP3 player.